Weighted blankets have recently become incredibly popular, and for an undeniable reason. Similar to a firm hug, these comforters help to calm the body and mind, while promoting a more sound sleep. Most importantly, these heavy blankets have been shown to help both adults and kids with Autism Spectrum Disorder, ADD/ADHD Spectrum Disorder, and Sensory Processing Disorder (SPD). Today, we’re going to explore the ways weighted blankets can benefit people with SPD. 2 Can Weighted Blankets Help Relieve SPD Symptoms? 4 What Does it Feel Like to Have SPD? 5 What’s the Difference Between Adults and Children with SPD? 5.1 What is a Sensory Diet? Sensory Processing Disorder (SPD) is a serious condition in which the brain has difficulty receiving, organizing, or/and responding to information that the body gets through the senses. People with SPD have trouble doing most daily tasks and oftentimes can’t manage their emotions due to it. Autistic people are more likely to have SPD and the symptoms of these conditions can overlap. But still, don’t confuse it with Autism Spectrum Disorder. Sensory Processing Disorder is an absolutely different condition that causes a painful sensory overload, including a high sensitivity to the lights, sounds, and all kinds of surrounding stimuli. 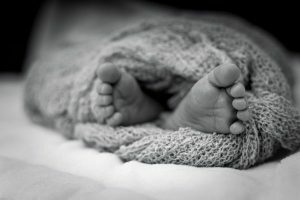 Can Weighted Blankets Help Relieve SPD Symptoms? A heavy blanket is literally a lifesaving device for families who have kids or adults with SPD. Sure, it’s not the only treatment and you still have to follow your doctor’s instructions and take prescribed drugs. However, a weighted blanket can significantly reduce the symptoms of SPD in children and adults alike. It provides a proprioceptive sensory input that helps to calm the body’s “fight or flight” response. This response occurs naturally and can worsen a meltdown. A heavy blanket provides a self-soothe effect that aids in taming a meltdown, especially in children. Even though SPD symptoms are similar in kids and adults, there’s a difference that we’ll discuss in a few minutes. But how can a seemingly simple blanket aid with your child’s SPD symptoms? 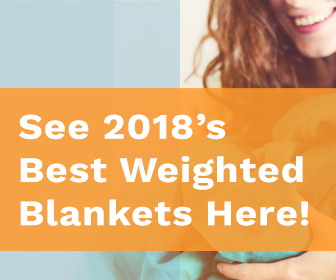 Most heavy blankets are created to weigh 10% or 15% of a child’s body weight, providing the same effects of a strong hug from a loved one, just like if you were swaddling a baby. Weighted blankets are used in the deep pressure therapy, which is believed to treat many disorders, including SPD. The extra weight of the blanket puts an intense yet safe pressure on sensory receptors of the body, helping the Autonomic Nervous System (ANS) relax. ANS is a division of the nervous system that controls a number of unconscious actions, like heart rate, breathing, and digestion. ANS breaks down into two sections – the Parasympathetic Nervous System (PSNS) as well as the Sympathetic Nervous System (SNS). SNS is the “fight or flight” response of the body. It stimulates a release of hormones that increase breathing, blood pressure, and blood sugar. The sweaty palms and pounding heart are the major signs of SNS. Unlike SNS, PSNS is dominant during the quiet and peaceful times. It reduces breathing, heart rate, and blood pressure and helps you feel calmer. SNS is dominant in people with SPD and oftentimes it’s hard to achieve the PSNS state. When the body is always in a “fight or flight” response it becomes harder to think, focus, and sleep. The Deep Pressure Therapy that uses weighted blankets helps to balance ANS, reducing SNS and increasing PSNS. Children with SPD who have a balanced ANS have less frequent meltdowns, sleep better, and have better learning abilities. Adults with SPD can benefit from the deep pressure therapy as well. But they need to put more effort into learning how to control ANS. That’s why it’s highly important to choose the right weight of the blanket. Reduced frequency of tantrums and meltdowns. Children with SPD often grow into adults with sensory issues. Although adults with SPD can live a normal life, they face tons of challenges on a daily basis. They have trouble performing activities, following routines and building close relationships. If you’re an adult, and you have SPD, you know how life is unbearable at times. 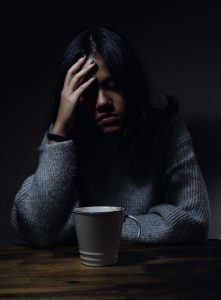 Since you’ve struggled with your disorder most of your life, you may experience social isolation, underachievement, depression, and other secondary social or emotional effects. The world seems to wear you out so much that perhaps you wonder how you can actually have a normal life. The good news is you can live a happy and fulfilled life. With a host of medical treatments and deep pressure therapy mentioned above, an SPD struggle becomes much easier. If you aren’t an SPDer, but a neurotypical person who knows or lives with an SPDer, you may not fully understand what it’s really like to handle sensory challenges. So I’ll do my best to help you out with that. What Does it Feel Like to Have SPD? SPDers tend to notice the tiniest things within their field of vision. Most importantly, all those things can cause lots of stress and lead to panic attacks. Just imagine feeling uncomfortable through your 8 senses and experiencing several stressful actions happening at once. Wouldn’t it be overwhelming? They might have similar symptoms, but they do have different personalities. Thus, they can sense differently and experience different symptoms. As soon as you learn a SPDer’s personality, it’ll be easier for you to understand them. People with SPD become highly emotional in case of too much sensory input and they may have a repetitive behavioral response. Crying, screaming, laying on the floor, biting things and people, and running are just a few extreme responses SPDers show when they’re irritated. Most of the time, it’s hard to understand why you respond this way because SPD leaves you no choice. Yet, thanks to modern deep pressure therapy products like weighted blankets or vests, it’s easier to control both behavioral and emotional responses. Can you spend a day without a hug or any other type of a deep-pressure touch? This may not be a problem for you, but an SPDer craves a great input from particular senses. A day without a deep-pressure touch can bring many unbearable emotions and end up with a meltdown. This is where weighted products help. If you think people with SPD don’t have any other mental issues, you’re mistaken. SPDers are often diagnosed with depression and various kinds of anxiety disorders. If you want to find out how weighted blankets help to fight anxiety and depression, go here. People with SPD need to undergo several treatments in order to live a normal life. A sensory diet is one of the most important parts of treatment. Read more about it below. Sleeping under a 15+ lb. blanket, hugging a weighted stuffed animal, wearing earplugs or blue tinted glasses… It seems strange, but SPDers have their own rituals that help them survive another day without a meltdown. What’s the Difference Between Adults and Children with SPD? There are actually a host of differences between children and adults with SPD. Are considered daydreamers because of poor concentration. Have meltdowns, outbursts, and tantrums that create frustration and chaos. Have behavioral issues in the classroom, and others may believe he’s a spoiled child. Struggle in the workplace with loud coworkers or busy workspaces. Unlike children, adults are more likely to receive a proper diagnosis and therefore a more effective treatment. A sensory diet is a specifically designed plan that involves different forms of sensory input to help people with SPD stay self-regulated and focused throughout the day. This personalized activity plan can include energizing or calming activities, depending on your needs. If you’re highly energized, you need calming input, such as carrying books or rocking in the chair. If you lack energy or you’re sluggish, you may need more stimulating input like listening to loud music or jumping up and down. These ones are usually used to relieve the symptoms of SPD. Adults with this condition simply get into a habit of working out regularly and use weighted products, like heavy blankets, to reduce their symptoms. A vestibular input is, simply put, a system that combines the simultaneous movement of your eyes, head and body, and explains everything to your brain, to perform an activity that requires all of this pieces to work together, in order to be performed. The vestibular system is all about movement and balance. Difficulties with its processing can negatively affect many aspects of daily life. A kid may appear hyperactive, lazy, inattentive, clumsy, anxious, or impulsive. And one reason that could explain why the kid behaves this way might be that he has trouble processing this inputs. Whether you’re an adult with SPD or your child suffer from this disorder, understanding the basic aspects of it can help you cope with a problem better. Weighted products, like weighted quilts and vests, are a great way to provide relief to many of the symptoms related to sensory processing disorder.